Beretta Fleur is an artist, graphic designer, and author of the book “Hosting With Style – Beretta Fleur’s Guide To Parties and Homemaking“. Beretta is also the designer, publisher and creative director of Dames Planes and Automobiles Magazine, a quarterly hobbyist publication est 2012, featuring classy pinups, vintage lifestyle, classic cars and warbirds. A portion of all sales goes to assist veterans and active military. 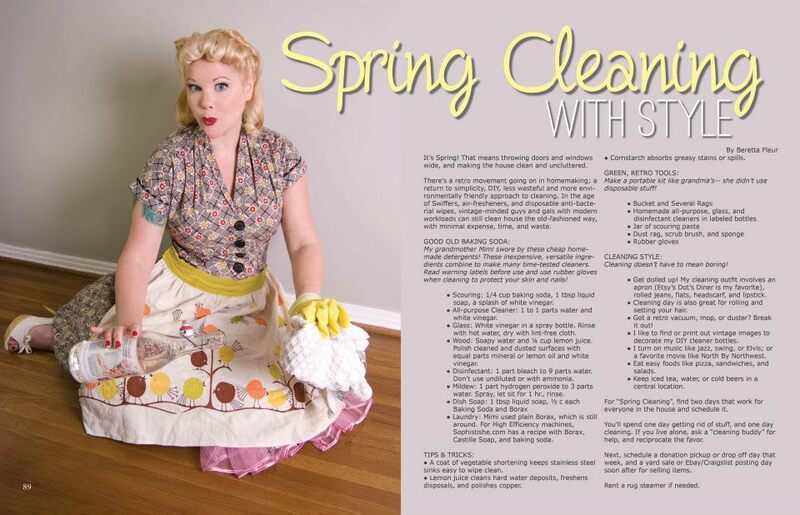 Besides running her own design studio and forging a successful career as a print production manager and special events director, Beretta has contributed to several vintage lifestyle magazines, including Atomic Bombshells Magazine, Bachelor Pad Magazine, Pinup Perfection Magazine, Dames, Planes, & Automobiles, Drive-In Magazine, and others. You can find her writing online on OffBeat Home & Life, BerettaUSA, and The Daily Meal, among other places. See her article archives here. Beretta styles, and edits vintage-style photos with her husband through their photography studio Shotgun Pinups. As a former vintage-style spokesmodel, she has worked with many great photographers, models, and artists in the modern pinup and rockabilly culture. She has appeared nationally and internationally in print, web, and on radio, viral video and television on behalf of animal activism and small businesses. She is always happy to be involved in projects that benefit animals, humanity, and the U.S. military & Veterans, and she values building positive community around these ideals. Beretta also spends time hiking, traveling, and shooting, including NSCA- rated sporting clays. She also donates time, money, and services to animal welfare charities and non-profit organizations, including: German Shepherd Rescue of Orange County, Best Friends LA, Operation Kindness, Linda Blair World Heart, Animal Match Rescue Team (Long Beach), Autism Speaks, The French Bulldog Rescue Network, Cup of Joe for Joes, Valentines for Vets, Heifer International, and Farm Sanctuary. She enjoys life in Texas with her beloved husband, and their three dogs. You can connect with her on Facebook , Twitter, Pinterest, and Instagram.